You are cordially invited to participate in our upcoming meeting Modern Wound Care Management (MWCM) which is being held at Grandover Resort in Greensboro, April 26 - April 27, 2019. 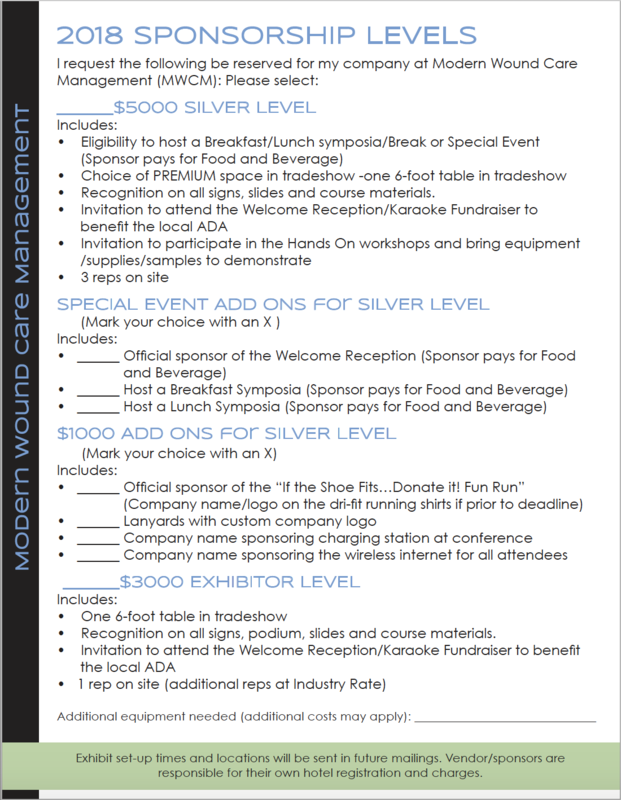 After a very successful conference in Scottsdale, AZ this past winter, we invite you to continue with us on our mission to educate wound care professionals while also raising funds to donate shoes to those in need. MWCM will partner with a local charity to raise money in order to help those specifically with chronic wounds. We will be partnering with the local chapter of the American Diabetes Association to create the campaign “If the shoe fits…DONATE IT!” Monies raised through donations from registration and the ribbon campaign will go directly towards buying diabetic shoes and orthotics for those diabetic patients that are in need and at high risk of foot ulcers. I hope you will seriously consider being part of the exciting meeting that sincerely seeks to elevate the quality of wound care and also directly benefits local patients with chronic wounds through charity giving. Attached is our sponsorship form listing the different levels of support available to you. We look forward to hearing from you soon! To Be Determined - Please check back.